Microsoft Excel is a spreadsheet application distributed by Microsoft and the basis of all data entry jobs. It allows the customer to have the ability to use simple spreadsheet capacities like practical tools, equations, diagrams and other critical tools. Every one of us knows all the essential options of Microsoft Excel, but there are many advanced excel functions which very few know. It is one of the major benefits of getting advanced excel training. Advanced Excel today is the need of great importance and taking in the skills of advanced excel can lead you to stand out among a big crowd of people. Most of the companies require that just being skilled in Excel isn’t sufficient. Applicants need to have an industry standard certification to prove their claim and facilitate the recruitment process. The Advanced Excel Certification is acknowledged globally and benefits the applicant with a superior recognition and competitive edge over non-certified professionals. The term Advanced Excel is a quite precious tactic than an actual learning benchmark of MS Excel. It provides a good insight into the latest and advanced features available in Microsoft Excel. It also gives you the comfort of using graphics, tables that are utilized in reports presentations, sales and others. Moreover, it incorporates ways to identify trends by means and averages that will be useful when trying explanations of the behavior of certain figures. Here we listed some of the important benefits of getting advanced excel training. What does it mean is that when you choose for the Advanced Excel Training, you will get comfortable with the skills that not many people understand. So you stand better among other individuals with comparable capabilities just like you. Therefore, advanced excel skills will bring excellent job opportunities for you and you will be an outstanding candidate for your employers. Business organizations are looking for employees who are willing to study and have extensive analyzing skills. A proficient of Microsoft Excel means that you have awesome analyzing skills and you will be a strength of the company. Hence, you will get grand pay scales and good job opportunities. If you are a small business person or a freelance worker, the advanced excel can assist you in saving a significant amount of time. Managing and analyzing data on the right path with essential Excel skills needs a decent measure of time. However, if you intend of all the complicated functions and practice of Microsoft Excel, then you can do the similar job in the least possible time. Here, advanced excel training is thought to be quite useful for your business and your career as time is significant in the business world. Advanced Excel training does not just mean that a person becomes an expert in excel. But in the meantime, it also increases your knowledge and administration skills. During the training period, you will get comfortable with the complicated functions which include cells formatting, macro, making use of the graphical representations in spreadsheets, financial complex formulas, etc. A skilled professional in advanced excel is high-quality at arranging and analyzing data and thus in his advanced excel training. He also gets excellent management skills inserting more power into his recommence. If you are well-trained in ms excel, you don’t need to worry about the salaries. Because ms excel in analytics is something which will never allow you to get worried about the wages. Although, the small and large scale companies look forward to hiring skilled MIS professionals and provides a higher salary. A Microsoft Excel Certification is primarily for the recruiters who don’t know your skills working on the platform. It assures the clients or employer of your ability to execute. The exam material likewise provides something technical to be discussed during the interview. According to a study done by CompTIA, MOS certifications can earn about a 9% increase in salary and as much 29% in the long run. In a comparable survey done among employers, statistics suggest that a selector feels better hiring a certified professional even if they demand a great salary than no-certified professionals. In 60% of the cases, a MOS certification has prompted to a job. Advanced Excel certifications are being considered for better marketability, better acknowledgment, and better pay. Once you have enrolled for the excel certification exam, you will be scheduled a date and also be equipped with self-paced practice papers from Microsoft IT Academy. It is advisable to go for the Microsoft Certification study guide before enrolling for the MOS exam. Visit the official site of Microsoft to buy reliable guides like Microsoft Certified Application Specialist Study Guide. If you can, go for more than one manual for comparing the information, the MS Excel certification isn’t a difficult task. But, you have to stay focused and have a total working knowledge of the application. Next, download the same number of practice exams and review the sample goals to be possibly asked for the exams. These practice tests will not just help you to understand and measure your taking skills, but also give a rough idea on the overall structure of professional certification exams. There are many organizations that offer free trial exams. Sign in their sites and request a free voucher for Excel certification test. The more you practice, the more comfortable you will be during the last tests. Register on Microsoft and different sites for many test papers and study guides. These documents will be sent to you by mail. It is likewise when you should be prepared to pay for the training center you will take your test. All the procedure will simply require a month if you are already working with MS Excel for a long time now. Make sure to learn and utilize the most recent features of MS Excel certification requires you to be updated. The final test will be like the simulated exams that you have attempted the most recent month. The questions requested in the MS Excel certifications aren’t difficult if you have a working knowledge of the application. Be sure, and you should be doing fine after all of those official practice sessions. The exam is more aligned with the way candidates would utilize the application in their general life and on jobs. Passing the certification will acquire you acknowledgment from Microsoft. It will send you by email, and you are permitted to take printouts and utilize the tag beside your name in CVs. Nowadays in the ardent work environment, companies need to adjust to the low-cost efficient mechanism, managing data of businesses, daily transactions and so on. In the preceding situation, Excel helps us in sorting data, doing a calculation with the desirable result. By utilizing Excel our time will save and it makes our work easy. This great application can be learned by Kids, Housewives, Professionals and so on. There is demand for qualified professional in job markets. Students can work in offices and MNC companies. After completing the excel training you will get job opportunities in different sectors. There are many institutes offering Advanced Excel Training. 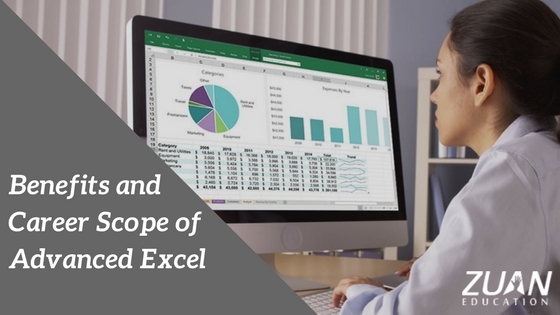 MS Excel has many advantages to those who are working with multinational companies utilizing different advanced excel formulas and functions while preparing ready MIS reports for their organizations. Excel is widely used to make financial statements, and other types of financial reports, for example, budget, forecast, ratio analysis, financial modeling, business scenario and various other reports. MS Excel users around the globe utilize this program effectively by creating many workbooks, preparing complicated reports that contain various links between workbooks briefly using formulas, MIS reports like balance sheets, profit and loss account & trial balance. The demand for Skilled MIS professionals is growing rapidly. Especially in India, the need for these abilities is on the hike and more MNC companies require professionals who can contribute to the world of analytics. The following job profiles are the most popular and demanding in this niche. Most of the person did not know more about advanced Excel. Learning MS Excel skills will open doors for data analysis, business analysis, MIS, etc. Career scope of advanced excel is excellent in the job market. Big data and data science are two significant fields with attractive salaries. Getting an advanced excel certification isn’t a difficult job, but it assists with profitable advancements in your career. This certification benefits you to establish your skills and getting recognized for your ability to work in Microsoft Excel platform. With little investment, it is advisable for all professionals in the field to acquire MS Excel certification. Ms Excel always makes the database job simpler and it is quite useful to have a certification so that it can serve as a compelling advantage during job search.